A dwarf is a creature of obligation. They are defined by their oaths. Dwarven oaths are made to their clan. 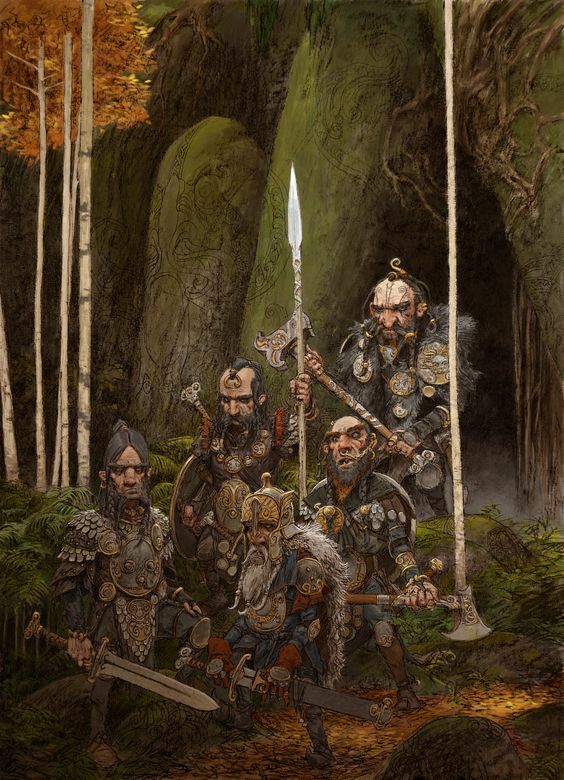 The clan is the center of a dwarf's life. An individual dwarf is nothing; the clan is everything. Dwarf adventurers are those unbound by oaths, either because they are oath breakers or they no longer have a clan to swear oaths to. Both states are equally pitiable. Other dwarves call them "petty dwarves" because of this. If a petty-dwarf has broken an oath, he is reduced to being a simple merchant. He can sell the least trinkets a dwarf-hold turns out--the rejected scrap and apprentice's mistakes--for whatever he can get for them. This is why most humans think of dwarves as being petty-dwarves. They've never had the opportunity to see a real dwarf pursuing his true art. Exception: The other type of dwarf you might see outside of dwarf-holds are dunter. They are upholding the oath of vengeance until they die. You see them around sometimes, trying desperately to die. They'll be discussed in another post. Humans who glimpse dwarf-holds sometimes report that there are several "races" of dwarves. This is not true. Dwarves are separated into different castes based on their obligations to the clan. Humans might think of these as "professions," but that's fairly antithetical to the dwarf mindset. Some biologists believe that an individual ant isn't a discrete creature. Rather, the colony is the animal, made up of several thousand parts. Or perhaps consider the Portuguese man o' war, which looks like a single jellyfish, but is in fact a segmented colonial organism like some sort of polyp Voltron. Dwarves think about the clan in the same way. The clan is the creature. Each caste performs one of the clan's essential functions. In a basic way, each caste produces a different type of craft, but a dwarf would never think about this as his "profession." It is his duty. Castes aren't hereditary and they're not stratified. All castes are equally important to the success of a clan. 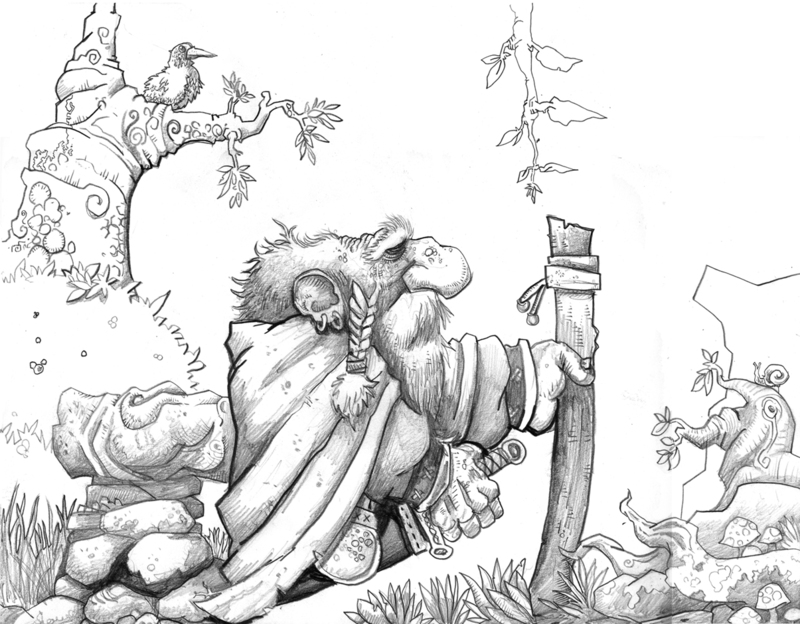 A young dwarf (called a beardling) chooses which caste to join based on his talents, predilections, and clan needs. However, once a caste is joined and oaths are made, it physically affects the beardling. The beardling "grows" into the caste. His caste is reflected in his appearance and temperament. There are seven castes. Each has a different name, and each produces a different dwarf-craft. There are the Clurichaun, who brew. Clurichaun are rather tall for dwarves (most scraping the lower-end of 5'). Their cheeks and large noses are ruddy with drink, and their hair is fiery red. There are the Coblynau, who are the masons. Their skin is milky white and their hair is an outrageous blue-black. Their eyes reflect light like a cat's. There are the Duergar, who are the smiths. Duergar skin and hair are coal-black. Their eyes are bright red like coals. There are the Hobs, who do the weaving. Hobs have brown, leathery skin and brown, curly hair. Their hands and feet are notably large. Hobs are the shortest of the dwarf castes, being something in the neighborhood of 3'. There are the Knockers, who cut gems. Their skin is brown and wizened and very wrinkled. Their hair is snow white. There are the Korrigans, who are the carpenters.They have goat-like ears, long noses, and never comb their wiry blonde beards. And finally, there are the Dwarrow, who create laws. (Yeah, dwarves think about laws as being constructions, like castles or something. They're basically the dwarven rulers, but dwarves wouldn't characterize it like that.) Dwarrows have grey, stone-like skin, white hair, and eyes that resemble gems. Where are all the lady dwarves? The clerics and natural-philosophers among mortal men sometimes ask this question. Here are some theories; some of them might be true. Dwarf women are so rare that they are treasured more highly than mithryl and gold. They are kept deep in the holds so that no harm will come to them and the dwarf race can be prolonged. Dwarves are not born, but crafted. The secrets of golems began with the dwarves and perfected by dwarves. Like Pygmalion, they bring forth life from stone. Dwarves were discovered deep under the earth by their creator-god. Every dwarf who dies is one less dwarf in the world. Dwarves don't have women, so they have to steal babies. Don't let a dwarf into your steading, or they'll steal your children and leave behind a little stone and wood poppet! The ones with the beards? Those are the women, you idiot. For true dwarves, use hit points, saving throws, experience points, etc. as a cleric. Dwarves can make a number of magic items based on their level. Dwarves practice a type of magic called dwimmercraft. They distinguish dwimmercraft from a sorcerer's magic by saying that a sorcerer "steals" his magic, but a dwarf's magic is derived from his excellence. A dwimmer is a particular expression of magic (analogous to a spell). A dwarf begins the game with two magic items that he has made. As he levels up, he has the opportunity to craft more magic items. Dwarves refer to "inspiration" when it comes to this craft. A dwarf can create many excellent things, but a fit of true inspiration only comes a few times in a lifetime. A dwarf need not create a magic item as soon as he levels up. He can do it at any point that he chooses, assuming crafting such an item won't raise his total number of magic items beyond the max allowed by his level, he has time, and he can afford the resources needed. Instead of making a brand new magic item, dwarves may elect to improve or reforge an existing item with new dwimmers. This improves the utility of the item, but also makes the item more precious and the loss the greater if he should lose it. Remember, a dwarf has a total of magic items he can create in his lifetime, so every item lost is something precious to him. This is why tales of a dwarf's vengeance against thieves are so renowned. I think no discussion of dwarves would be complete if we didn't mention rules for breaking and repairing items. Shields and helms can be sundered and reduce an attack's damage to 0, per Trollsmyth's Shields Shall Be Splintered. Weapons can be notched (reducing the damage type by 1) if you elect to deal a savage blow with the weapon. Savage blows attack Blood directly, bypassing Sweat. You have to elect to do a savage blow before you roll the dice and see the result. So, yes, you can notch your weapon and still miss. 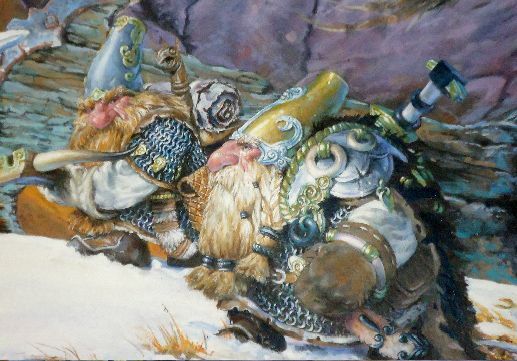 Any dwarf (even if he's not particularly skilled with the materials involved) can repair a notched weapon by one dice step if they have a tinker's kit and a Turn. Each caste of dwarf practices a different "school" of dwimmercraft. Each caste can only make magic items of a particular construction, e.g., Korrigans must make wooden items, Hobs must make woven items, etc. Each caste has ten dwimmers they can shape into their crafts. A dwarf knows each of the dwimmers of his caste. Clurichaun are unique (well, except for the Dwarrow, sorta) in that they don't create permanent crafts. Rather, Clurichaun's dwimmers are written into their recipes. Each recipe is essentially a magical formula. A clurichaun can brew each recipe known once per day, and it takes one Turn to prepare the brews for the day. If the brew is something, like, a beer that would normally take months to ferment, assume the recipe "puts the finishing touches" on an already-brewed beer. It turns wine into mulled wine, or something. Consuming a brew (food, drink, whatever) uses the same rules as drinking a potion. A clurichaun can use his magic item allotments to learn the same recipe twice if he so chooses. A clurichaun can combine two dwimmers into a single recipe, as normal. Example Crafts: Recipes for stews, rat jerky, beers, ales, wines, meads, hooches, hard breads, goat cheeses, fried rats, etc. When this dwimmer-food is consumed, the dwarf's belly fills with noxious gases that ignite when exposed to air. The round after the dwimmer is consumed, you can breathe a 30' cone of fire that deals 1d6 damage + 1 per brewer's level. Every round, roll a d4 to recharge this power. If you roll a 1, you must breathe the cone of fire or take the damage directly to your Blood. This dwimmer lasts until the encounter is over. You become kind of drunk, but brave. You are at disadvantage to Dexterity saving throws, but automatically succeed on Wisdom, Intelligence, and Charisma saving throws. You are immune to mind altering effects: fear, charm, etc. You and your gear grow to the size of a giant. Strength checks and Strength saves are made with advantage. You do double damage while making melee/missile attacks. You gain 1 hit point at the beginning of your turn. Sweat is refilled first, then Blood. This dwimmer lasts for 10 + Constitution modifier rounds. You gain damage reduction 2 as your skin hardens into iron. Because your skin is iron, which is anti-magic, you gain advantage on all saving throws against magic. Your movement is reduced by -15 feet. If you are under any physical effects (potion, poison, disease, etc.) you immediately retch and puke them all out. This includes all dwimmers delivered by clurichaun's brewing. If you are not currently under such effects, this dwimmer will remain inactive until you're first exposed to one. This dwimmer lasts until it is used, or until you sleep, whichever comes first. Your body quickens with a burst of supernatural speed. You can perform an extra standard action per turn. Roll a d4 every turn after the first turn you gain this dwimmer. If you roll a 1, this effect ends and you lose your turn as your body readjusts to normal speed. On a 2-4, you continue to act as if quickened. Your voice becomes very loud, and you're easily heard by an entire hall or cavern. Henchmen automatically succeed in morale checks if they are within 30' of you. Allies that can hear you make saving throws against fear with advantage. If you spend your turn speaking encouraging words to an ally that can hear you, you can make a Charisma check with advantage. The results of this check can be used in place of any saving throw that ally is making. You no longer need to breathe air. However, if you choose, you can drink in a gas you are immersed in with no ill effects. If you do this, you can belch it out as a 10 x 10 square of gas at any later time, or until you sleep, whichever comes first. Otherwise, this dwimmer lasts until the encounter is over. You fly into a fit of berserk rage. You cannot take any defensive, helpful, or curative actions. You can only try to kill your enemies. You will do this until all of your enemies are slain or driven off. If an ally damages you during this combat, they count as an enemy. Every time you take the attack action, you roll once and apply it against every adjacent enemy. You will not stop fighting, even when gravely injured. You automatically succeed on all Tears rolls to stay conscious, but take 1 Blood damage as normal. Your Tears dice automatically drops to the next step after this encounter is over. This dwimmer will last until the encounter is over. I don't think people who say classic fantasy is overwrought and boring are wrong. I just like it. I like it like I like folk music. It might be garbage, but it's sweet garbage. I like this garbage. I like making fantasy races feel more like their folklore inspirations than just rehashing Tolkien directly. I like riffing with Tolkien, not riffing from Tolkien sometimes. Most of all, I like actually giving rules to what has been an essential part of dwarfyness since their inception: magic items. How has this never been a core feature of their race before? How has it always been a piece of fluff, almost never a piece of crunch? 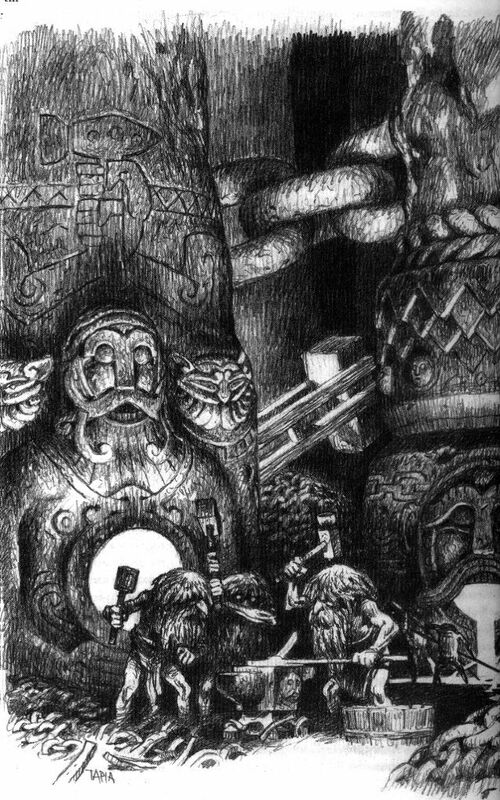 Other arts of dwimmer-craft and other castes of dwarves will be discussed in subsequent posts. This is getting too long.